I really looked forward to reading this book. I don't know anyone who has read it, but I love the idea of the main character being a librarian. It definitely had the feeling of a typical adventure/Fantasy series. A little cliche but overall entertaining. Enjoyed Jugh and his antics, as well as Craugh and his magic. The book leaves a big time cliffhanger and I look forward to reading Lord of the Libraries. On a downside, what's with the covers of the books in this series to be artwork specifically for the LoTR? This was a fun little hobbit-y knockoff, but the writing was pretty terrible. I overlooked it enough to pick up the second, but if there's a third I won't be reading it. A few weeks ago I read The Rover and found it an engaging read, so when I found out there were more I was eager to continue my adventures with Wick and gang. Not necessarily bad but nevertheless to my disappointment, the sequel takes place many, many years later, when Wick has been Grandmagister for ages already. He isn't even the main character in this story, giving way to his apprentice, Juhg, a mainlander dweller 'adopted' by Wick some thirty years ago and brought to the Vault. The opening was enticing for me, the prologue dark and mysterious, but the chapters that followed didn't keep me as enthralled. The narrative was sluggish, going off on explanations to various details that, while they do flesh out the world and history a little bit, unnecessarily interrupted dialogue and confused the conversation some. This happened throughout the book and contributed to why the story felt so slow and didn't catch me. The two detail typos that bugged me the most were, firstly, in relation to Raisho's eyes. Unless I read it wrong, one page described his eyes as brown and a couple pages later said they were blue, then they went back to brown. I could have misread it, though. Secondly (and this happened late in the second half) was when Juhg stood up at one point and a couple paragraphs down he's still holding (unnamed person's) head in his lap. That's hard even if you're four feet tall. These are nitpicky grievances, I'll admit, but as a writer they stood out and bothered me. Also, all throughout the story we get the idea that Wick and Craugh (the wizard only mentioned by name in the first book but is now part of the close group of friends) know something that Juhg doesn't which has very much to do with the destruction of the books. This enemy doesn't show up until the last few pages of the closing chapter, and we've never heard of him before. There was no real buildup for his entrance, either, he just so happens to spring in during the last attack with a history involving both Wick and Craugh that wasn't even hinted about until right then. Although I'm sure the details will be revealed later. I don't mean to bash the poor thing black and blue, though. It wasn't the greatest story, but it had its merits. There was some humor between characters who in turn weren't shallowly developed. The arguments between parties were pretty good, too. I especially liked the one between Juhg and Craugh about the reason behind the Cataclysm (more detail would involve spoilers that I'm not so inclined to reveal). All in all, I wouldn't suggest not reading it because of any of these complaints. I am invested enough in the story to keep going and find out what happens next (especially since this one ended on such a dramatic note that I am neither inclined to spoil). I've never encountered a story before so centered around books, where knowledge and the written word is the focal point of all the action. Books are the damsel in distress. Books are the treasure that must be rescued/kept from evil hands at all costs. Books are what the antagonist wants, not blood (although they aren't too shy in shedding it for the sake of their dastardly cause). In that respect this is a refreshing tale that I'm glad I found. This book although it's the second book in the Rover series is more about Juhg then Wick. I loved Wick, although he got on my nerves sometimes a part of me loved him. Juhg was the most annoying thing ever and I had NO connection to him. First off the writing in this book wasn't as good. I felt deja vu every time I read a page because Odom repeated things over and over. Yes I know Juhg was a slave and even mentioning it sometimes was okay but 3 times a page and going into detail about the same stuff I read 3 pages ago was a little boring. The other complaint I have about this is it's 380 pages, the book is slow nothing happens until page 210 or so. Which brings me back to juhg. This guy was the least grateful, bitter person in the world. I almost wished a monster would eat him and I'd be rid of him. Also as this is the second book it's really Book 2 part 1 because it ends and of course it goes on to book 3. There is no ending that leaves you satisfied. Lastly, the thing that annoyed me the most. Was the reference to stuff that was not in Rover and acting like we knew what was going on. This drove me crazy. I was very disappointed in this book, and I was really excited about the first one. so far I like Juhg's character. 4/10/10I finished the book so long ago I can't recall most of it. I do know that destruction of any books is never a good thing. I know some books are very bad, but somehow we can learn from that also. 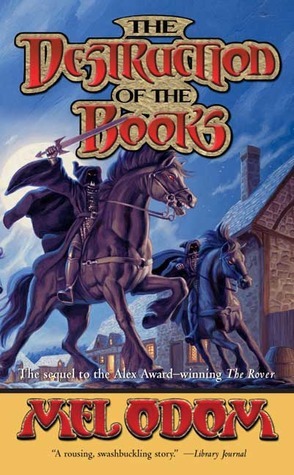 Juhg's character was good through all of these books that he is in.He is an adventuresome little person and even when frightened, continues on until the end.Great read! Second book in a series that is a somewhat formulaic heroic fantasy. There's your good guys, there's your bad guys, there's a librarian. What's that you say?, a Librarian?Yup. Librarian. In fact a whole island (ok, not all of the island, just most of it) of 'em. That's our "hero". a slightly different, more imaginative (or is that motivated) librarian. Not as good as the first in the series, and even more blatant with the LOTR references. Also noticed typos like the other reviewer did--and not just typos, but words that were wrong or grammatically incorrect sentences. Odom got shortchanged on the editing here. The main character repeats a few things a few too many times. It is clearly a set up for a third book. There are a few mispellings/wrong words mixed into the book. This does not detract from a solid read based in a well defined world. Why did I bother reading this to the end if it's not that good? Because there aren't thant many fantasy books that deal with librarians and libraries!Come to think of it, are there any other not written by Odom? Having trouble getting through this, but I'm loving the librarian jokes. A great continuation of the series. The story is fresh and captivating, and not at all rehashing of the previous book (unlike some reviewers suggested).Parent rating: graphic fights, no indecency. #2. Not as good as the Rover, but still good. Mel Odom - Librarian Note: There is more than one author in the Goodreads database with this name.aka Jordan GrayMel Odom is a bestselling writer for hire for Wizards of the Coast's Forgotten Realms, Gold Eagle's Mack Bolan, and Pocket's Buffy the Vampire Slayer and Angel book lines. His debut SF novel Lethal Interface made the Locus recommended list . The Rover was an Alyx Award winner. He has also written a scientific adventure of the high seas set in the 19th century entitled Hunters of the Dark Sea. He lives in Oklahoma.